The Major League Baseball Umpires Association called upon the MLB Office of the Commissioner to address several recent instances of personal attacks on officials in a move reminiscent of MLBUA's August 2017 wristband stance in protest of umpire abuse and verbal attacks similar to those before baseball today. 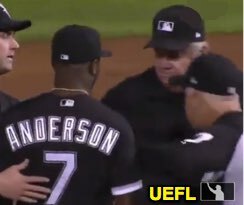 MLBUA's call to action follows postgame comments by White Sox shortstop Tim Anderson, ejected Saturday night after continued argument with Joe West concerning a Replay Review decision that confirmed West's slide rule interference no-call, who said of West, "I don’t have much to say about him; everybody knows he’s terrible." Related Post: MLB Ejections 173-174 - Joe West (3-4; CWS x2) (9/22/18). Umpires have respected this game, and have handled the details of ejections for everyone's sake including the Office of the Commissioner with utmost privacy. Verbal exchanges on the field and ejections used to be handled and left on the field and reported to the office. *New trend, players taking their emotions and feelings to the press and twitter to blast our umpires. Video: Gomez called for replacing plate umps. In a straw-that-broke-the-camel's-back theme, Anderson's postgame criticism of West Saturday night follows ejected Rays player Carlos Gomez's Twitter rant against umpire Andy Fletcher on Thursday evening and Friday morning. Gomez, whom Fletcher ejected for arguing a strike three call, wrote on the social media website, "If anyone needed to be ejected out of tonight's game it was Andy Fletcher!!" Gomez also uploaded multiple videos of the pitch in question (opting to record portions of the video showing where the catcher caught the ball rather than where the pitch crossed home plate) and broadcast several live streams on Periscope in which he continued to verbally rail against Fletcher, claiming that Fletcher missed 30+ calls, failed to do his job, and that the league must institute computerized pitch calling in order to combat what Gomez deemed a league-wide problem with umpires, sarcastically writing, "👏🏽👏🏽👏🏽👏🏽heck of a job out there tonight Andy Fletcher!" Gomez also called for penalties for perceived poor plate performances by sending the umpire down to the minor leagues, fining the umpire, and/or releasing the umpire from service. Gomez concluded his remarks by imploring his MLB player colleagues: "@MLB @MLB_PLAYERS this is why we need an electronic strike zone!! This is ridiculous!" UEFL QOC for that pitch was incorrect, by 1/2 of an inch; Uncorrected Statcast (Pitchcast) had the pitch as off the plate by as much as two inches, while the league's umpire grading system reportedly did not flag the pitch as incorrect. This discrepancy across systems is part of the problem, which we will cover in a later article. Related Post: MLB Ejection 171 - Andy Fletcher (6; Carlos Gomez) (9/20/18). This, in turn, follows Ben Zobrist's August 14, 2018 ejection at the hands of HP Umpire Phil Cuzzi, purportedly for invoking the electronic strike zone motif during his playing field argument with Cuzzi. UEFL QOC for that pitch was incorrect, by 2/3 of an inch. Related Post: MLB Ejections 119-120 - Phil Cuzzi (1-2; Maddon, Zobrist) (8/14/18). In June of this season, ejected Royals pitcher Danny Duffy made it personal with HP Umpire John Tumpane, of whom Duffy stated, "I’m personally tired of getting punked by Tumpane. I think we all are. And I think it needs to be looked at. I’m not saying there’s bias there but I’m sure it will go back to whoever it needs to go back to." Because Duffy's remarks concerned an entire game and umpire-team history rather than just a single pitch, we ran the numbers and concluded, "The Quality of Correctness associated with all five of these Tumpane-KC ejections is QOCY (QOC% = 100%)." Related Post: Ejected Duffy Makes it Personal in KC vs Tumpane Claim (6/18/18). In early May, Mets player Todd Frazier said that umpire pitch calls were a problem for "everybody" and that, "These umpires have got to get better." For what it's worth, we also ran the numbers for Frazier and determined his argument was without merit. It all started with MLB's lax discipline in 2017. History: The then-branded WUA and Office of the Commissioner found themselves at odds in August 2017, when WUA announced a white wristband protest following MLB Chief Baseball Officer Joe Torre's decision to fine, but not suspend, Ian Kinsler for postgame personal remarks about umpire Angel Hernandez. According to the numbers, Kinsler's $10,000 fine represented less than one tenth of one percent of his salary. To illustrate just how meaningless a $10,000 fine is to a player who earns a multi-million dollar salary, consider this comparison: for a person drawing a $50,000 annual salary, a 0.09% fine corresponds to a financial penalty of $45. Related Post: Fined - Kinsler Not Suspended for Hernandez Comments (8/18/17). Then there's this whole "Did They Didn't They" issue of an upset pitcher possibly targeting an umpire. Related Post: Did Detroit Throw at Umpire Wolcott? A Visual Analysis (9/14/17). Gil's Call: Whatever the MLB Commissioner's Office discussed with the World Umpires Association Governing Board in 2017, the meeting whose announcement suspended the white wristband protest after just one day, clearly hasn't worked. 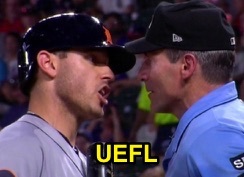 Just one year removed from the Kinsler fiasco, MLBUA is again calling attention to a recent trend of umpire abuse—specifically continuing the argument after the game is over in order to complain about the umpires—and imploring Commissioner Rob Manfred's office to take steps to address it. Related Post: WUA Secures Commissioner Meeting, Suspends Protest (8/20/17). Worse, still, we know that sports across the continent are suffering from referee and umpire shortages due in large part to abuse. From youth to high school, and player/coaches to fans, this endemic problem is at the heart of what MLBUA deems "an attack on the integrity of the game." USA Today has called it a "culture of abuse," and MLBUA is far from alone in wanting abuse curtailed. When taken to an extreme, officials' abuse has led to violence and even injury/death, all thanks to a cultural problem that society at large cares very little about dealing with...generally because, "it's sports!" MLB has a perverse interest in allowing abuse. One thing we know will not work to combat the problem is the application of financial penalties without further discipline. When a player can pay just one-tenth of one percent of a salary, without worrying about missing any playing time, the penalty is simply ineffective. If MLB wants its punishment to have any teeth (which, as we've discussed many times in the past, it doesn't), it will have to begin issuing suspensions. Players will continue to abuse umpires one way or another—that includes postgame verbal attacks—if the only penalty is a lighter pocketbook. Related Post: Psychology & Marketing - Why MLB Discipline is Weak (5/19/16). 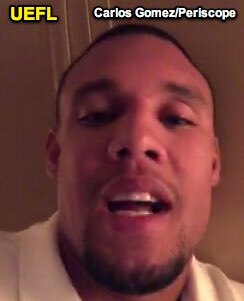 As Gomez said in one of his videos on September 20, 2018, encapsulating the entire argument against the sole imposition of paltry financial penalties for severe verbal misconduct: "I got plenty of money, keep sending me fines...I don't care how they gonna react to this video...If they want to fine me, it's fine. I'm rich...This year, we have too many replays that you f** up."